Big project last weekend, we got rid of our dead sod and added 150-200 sq/ft of new garden, space lined with a decomposed granite trail. The project really started last weekend, when I moved my raised bed from being off the patio, to the back of the yard between the playscape and the other raised bed. Thursday the backyard was tilled. My landscaping friend ACL Mike tilled for us for a great wage. In fact, it was largely his help that ensured this project lasted only 1 weekend. On Friday, we raked the soil level and installed the edging. Next, we added the weed fabric but ran out of fabric when we were about half the way finished. Instead of stopping, we started hauling in the granite on the finished side. Saturday was our big day. We finished the fabric and finished the first layer of granite. After the first layer, we used a compacter on the granite to set it in better. Then we added another layer and ran the compactor again. And that was it! Now we just need plants! See the pictures! I had about a 1/2 yard of granite left over and used a portion of it to redo our rock patio. Looks awesome! 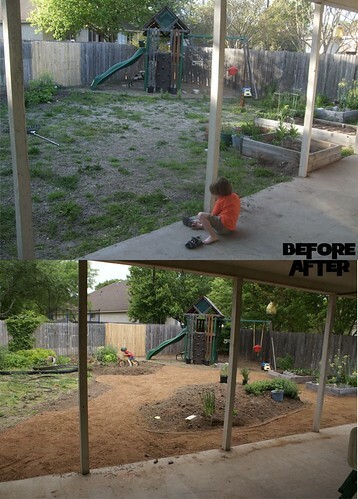 I want to do this to our brand new yard. The grass is dying anyway and a curvy raised bed wonderland would be SO much better! So what plants are you going to put in? go for it! the materials for this project were actually pretty cheap. we are hoping the island becomes a mix of herbs, onions, garlic, etc. and keeping the veggies in the back garden.